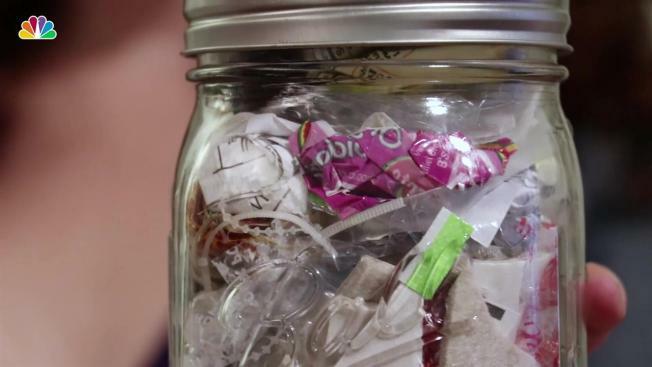 Amanda Lindner can fit all of her trash from the last seven months into a 16-ounce mason jar -- and she says you can do it too. Watch the video above to see all of her life-hacks for cutting down your carbon footprint. The Brooklyn woman's journey to the mason jar started when she decided to try a 50 day zero-waste challenge. According to Lindner, everyday objects like plastic straws, plastic utensils, and plastic bags are causing the most amount of harm to the planet, and are fairly easy to stop using. Since starting the zero-waste challenge, she has made it her mission to eliminate the most harmful waste objects from her life completely by carrying around a reusable coffee cup, bamboo utensils, and cloth bags. Lindner purchases most of her groceries in bulk and stores them in mason jars. She buys package free produce from farmers markets and transports it home in cloth bags. She also reduces her carbon footprint by eating a plant-based diet. While some may find a zero-waste lifestyle to be challenging, Lindner says it has allowed her to reduce her carbon footprint while saving money in the process. Watch the video above for all of her tips for a waste-free life.